Use timetotrade to set up your own customised Forex Alerts to execute trades, or notify you by Email or SMS when your trading conditions are met. Simple, intuitive "point and click" system - no programming required. If you're away from your computer timetotrade will watch the Forex markets for you. and when it's time to trade, we'll let you know! Forex Alerts - No Coding Required! With timetotrade’s innovative “point-and-click” Trigger Technology, creating your own customised Forex Alerts is simple. There are no programming languages to learn, or complex macros to write. 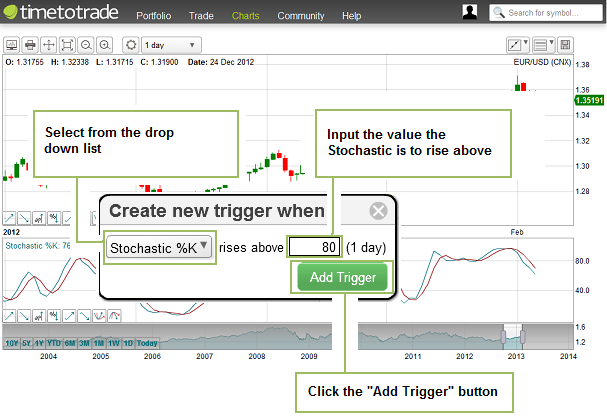 Just open your chart, click a Trigger Button, enter your parameters and activate ... and your Forex Alert is created. Simple! 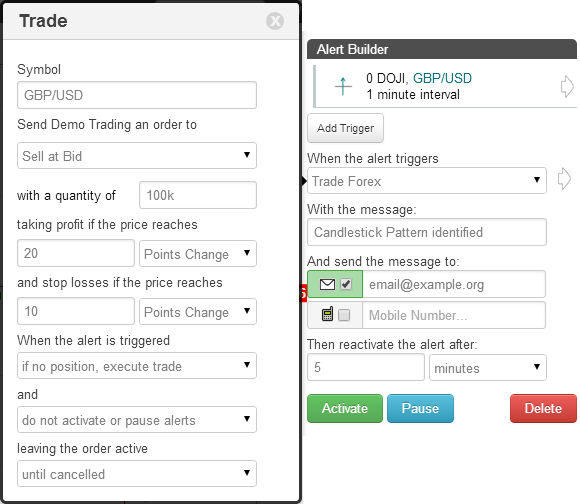 The next time your trading conditions are met, an alert will be sent to your mobile phone or email. 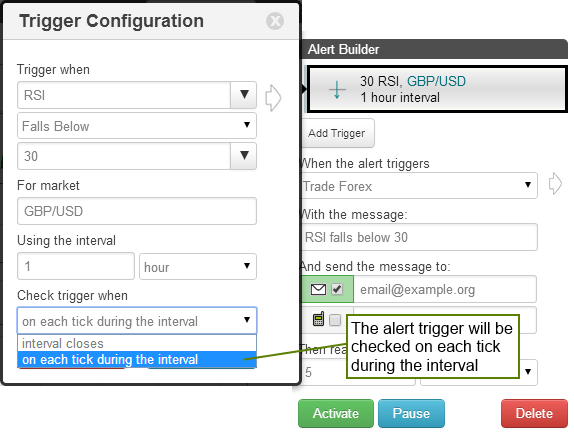 Build your own simple, Single-Condition alerts or create complex Multi-Condition alerts which will be triggered if a series of events occurs, for example you could create an alert on a Forex currency pair that will trigger if: the Stochastic falls below 20 followed by a MACD cross-over; or the RSI of a pair was to rise above 70, followed by a price spiking above a Bollinger Band. Use timetotrade to avoid missing trading opportunities. No matter where you are or how busy you are - when it's "timetotrade" we'll let you know! To create an alert, go to the timetotrade CHARTS page >> , enter the ticker symbol for the currency pair you wish to follow in the symbol look up box and select from the drop down. On timetotrade's Forex Charts you can add any number of overlays or secondary charts - choose from a library over 170+ indicators and even create your own indicators. You can adjust the indicator colours and default period and deviation parameters to suit your strategy. "Rising" and "Falling Threshold" Trigger Buttons can be used to create an alert to execute trades, or notify you, when the price or the value of an indicator rises above or falls below a particular value. For example, to create an alert that will be triggered and execute a trade when the %K oscillator rises above a particular value eg 80, just click the "Rising Threshold" Trigger button, as indicated in the screen shot below. 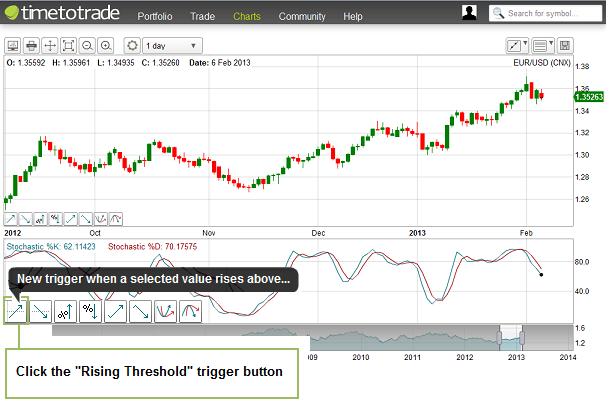 Once you click on the charts' Alert Trigger Button, a text box appears on the chart, as shown. Input the trigger value, eg 80 and Click the "Add Trigger" button. 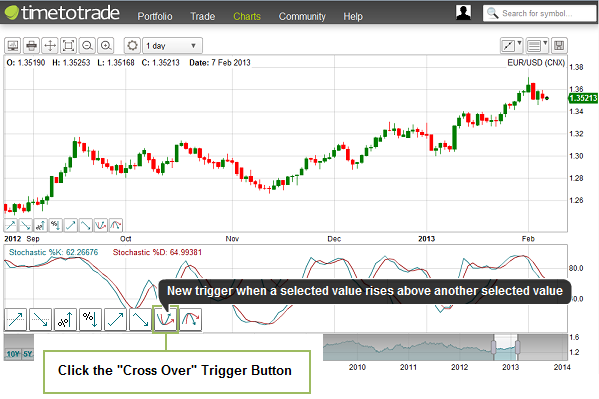 The trigger will appear in the the Build Alert widget to the right hand side of the chart (as illustrated below). From here you can further customise the alert: add your own personal alert message, choose whether the alert will run once or will be reactivated once triggered, add more triggers to create a Multi-Condition alert and select your preferred methods of notification (email and/or SMS alerts). 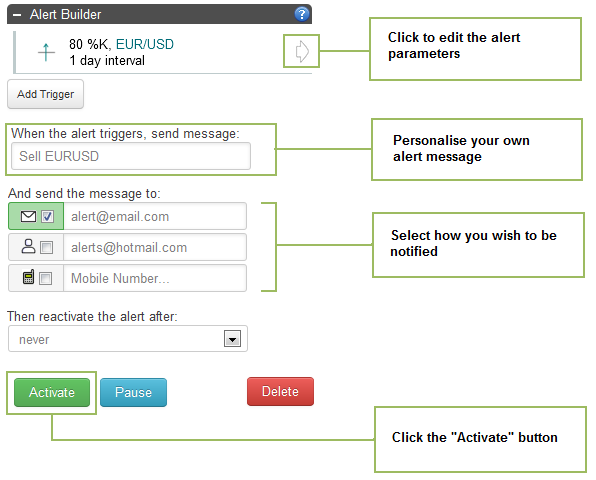 Once you have finished customising your alert, click the "Activate" button. Your alert is created. It really is that simple. The next time the stochastic %K rises above 80, you will receive an alert to your email or cell phone. "% Pull Back / Break Out" Trigger Buttons can be used to create an alert to execute trades, or notify you, when there is a percentage increase or decrease in the price or value of an indicator within a defined interval period. For example if a Forex currency pair was increasing in price and you wanted to be notified if there was a pull-back on the TSI of more than 2% in a day and therefore a potential change of trend, you would use the "Pullback" Trigger to create the alert to execute trades, or notify you, when your investment conditions are met. The "Cross Over" and "Cross Under" Trigger Buttons can be used to create an alert to execute trades, or notify you, when one indicator crosses another, or if the price rises or falls below an indicator. The next time the %K oscillator crosses over above the %D oscillator you will be notified by an alert sent to your email or cell phone. You customise the alerts to suit you: for example you can edit the alert message you will receive, decide how you would like to be notified and which email and/or mobile phone you would like the alert sent to. "Breakout" and "Pullback" Trigger Buttons can be used to create an alert to execute trades, or notify you, when there is a sudden change in price or the value of an indicator within a given time interval. For example if the Moving Average was falling and you wanted to be notified when it changes trend and increases by 5 points, you would use the 'Breakout' Trigger Buttons to create the alert to execute trades, or notify you, when your investment conditions are met. Step 3: Click the "add trigger" button. Step 4: Click the "activate button. The next time the Moving Average increases by 5 points, you will receive an alert to your email or cell phone. Select the "sleep period" if you would like the alert to automatically reactivate itself once triggered. Choose for alert conditions to be checked either at the end of the candle interval or checked on each tick received from the exchange. 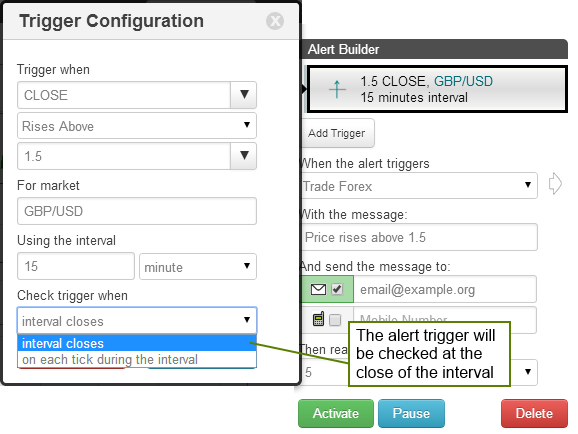 More information on how to use the timetotrade system to create Forex Alerts can be found on the Creating an Alert >> pages.